Chef Chris Koetke, Vice President of Kendall College School of Culinary Arts, has been out and about talking umami and MSG with culinary professionals, academics and students. 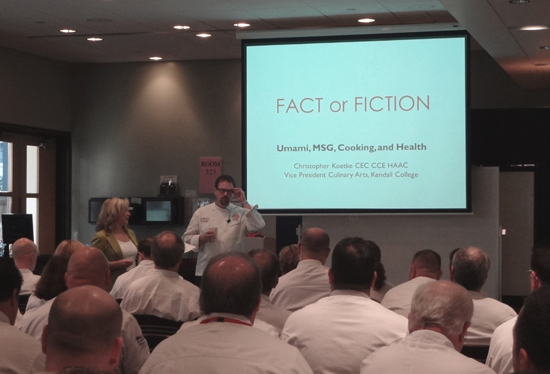 At a Science of Food event at the Center for the Advancement of Foodservice (CAF), Chef Koetke drew the largest attendance for an educational event ever for a session at the Center, addressing the health power of umami taste and myths about MSG. And a recent meeting of the Chicago chapter of the American Culinary Federation, sponsored by The Glutamate Association, drew more than eighty ACF members representing all sections of the food industry. The lively Question & Answer session which followed Chef Koetke’s lecture gave ample opportunity to dispel some misunderstandings about glutamate and its umami role. For example, some in the audience were pleasantly surprised to find that MSG is not an allergen and that it can be a very useful ingredient in developing healthy, tasty food. A station with three types of broth. One seasoned with neither salt nor MSG, one seasoned with only salt and one seasoned with both salt and MSG. Participants were to try each broth to compare how the seasonings change the flavor dynamics. A station where participants could taste a piece of Sautéed Beef with Red Miso Sauce. This station was intended to demonstrate how glutamate-rich condiments contribute to a food. A station with two types of aged ham to show how the release of glutamates over time changes the flavor in meat. A station with three types of aged cheddar, 1 year, 3 years and 10 years, also to demonstrate how the passage of time and the release of glutamate positively impacts the eating experience.